Having Bed Bugs Is Not A Personal Hygiene Issue! Bed Bugs invade all types of living quarters from High End Hotels to Humble Back Packer Hostels and every where in between. They are probably the most well traveled insect specie with infestations being spread mainly by luggage and "pre-loved" furniture. The first thing many people do when walking into a hotel room is to throw their luggage up onto the bed or furniture. It sounds harmless but watch in the video on this page how fast and agile Bed Bugs can be. Clothes on furniture or carpeted floors can be infected with Bed Bugs, to then be thrown into your luggage bag and brought home. Biting Insects are one of the most difficult pests to effective treat. For a successful treatment we do a vary of modern techniques which collectively will destroy the infestation. Hidden around the frame of your bed, these biting insects come out to feed once you have gone to sleep. Once you settle down for the night and stop moving about they wait until they feel the warmth of your body heat and come out to eat. Blood is needed to survive and for the females to produce eggs. The Bed Bug will pierce your skin using its needle like mouthpiece and draw enough blood in a few minutes to increase their body weight by five times. The Adult female Bed Bug will lay her eggs in the cracks and crevices of the bed and furniture. They have to be put out of harms way but close enough to be about to find a food source once they hatch. Normally misdiagnosed as fleas, Bed Bugs are round/oval in shape and approximately 5mm in diameter. They can change in appearance by being brown in colour then going to a dark red after a feed. Their low profile can also change to a much rounder one after feeding. Bed Bug bites are not painful at first and this allows them sufficient time to get a good feed. It is not uncommon for a bed bug to be on you, feeding for up to 10 minutes. They will mainly target exposed skin closest to contact with sheets and pillows. Diagnosing Bed Bug bites can be tricky as they might not be signs for days. Some people will show no signs of being bitten and others may break out into itchy red welts. If you develop a rash after being bitten by suspected bed bugs we suggest you seek medical advice. It is possible for a doctor to give you an allergy test which may indicate what caused the irritation. This is a much faster result than sending a sample board to our Entomologist. The most expensive thing about Bed Bugs isn't the treatment process, it is in fact the amount the furniture (beds, mattresses, lounges, rugs and carpet) that customers throw away. Most times all this can be saved using simple to install Bed Bug products. There are a number of products available which will be needed as part of the total treatment. Your Trained Bed Bug Expert can advise you on what products will be suitable for yourself. Adult Bed Bugs can survive more than a year without having to feed so this is a long term application. Bed bugs are one of the toughest pests to treat requiring a combined effort by us and the customer. Treating the adult bed bug is only the start of the process as there could be 500 eggs ready to hatch. We use a combination of both low toxic chemical and non chemical applications. We have a range of mattress, ensemble and pillow case protectors that your Technician will give you on the day of treatment. Also you will be provide a thorough "check list" on things you will have to do the day before the treatment is done. We need to conduct an inspection first to identify that the biting insect is actually Bed Bugs. 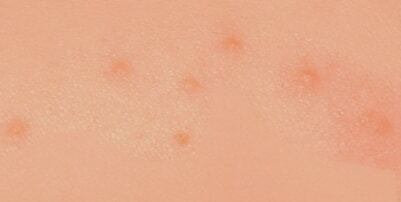 Seeing bite marks on skin usually gets attributed to fleas or bed bugs but can sometimes be some form mites or lice. If Bed Bugs or Fleas are not found but biting insects symptoms are present we can put down sticky traps to collect samples over the course of a week. Being microscopic insects, these samples are sent to an Entomologist for analysis. Once the results are received back we can do the correct treatment procedure to the biting insect that has been found. The treatment cost in dealing with bed bugs is more than your average Pest Control Treatment. This is because there is so much more involved in the treatment process and managing biting insects. A successful treatment may take two visits which will all be covered under the original price. We offer a 6 month warranty to guarantee the bug bugs are gone. To go through your Bed Bugs Treatment and get a price, please call our knowledgeable staff on 1800UNCOVER (1800862683).